This article show a guide on how to use FORScan to program parameters for Ford F150 2015-2016 screw OEM power fold mirror retrofit. Note: Trailer Tow Mirrors are not available with PTM (Paint to Match) skull caps. Black textured or chrome skull caps must be removed, sanded and painted to match body color. Note: Power Folding Non-Trailer Tow Mirrors are not available with black textured skull caps. PTM (Paint to Match) skull caps are shipped primed and must be painted to match body color. memory, auto dimming (driver’s side only), spot lamps, LED security approach lamps and BLIS – Does NOT support Technology Pkg. w/side camera. 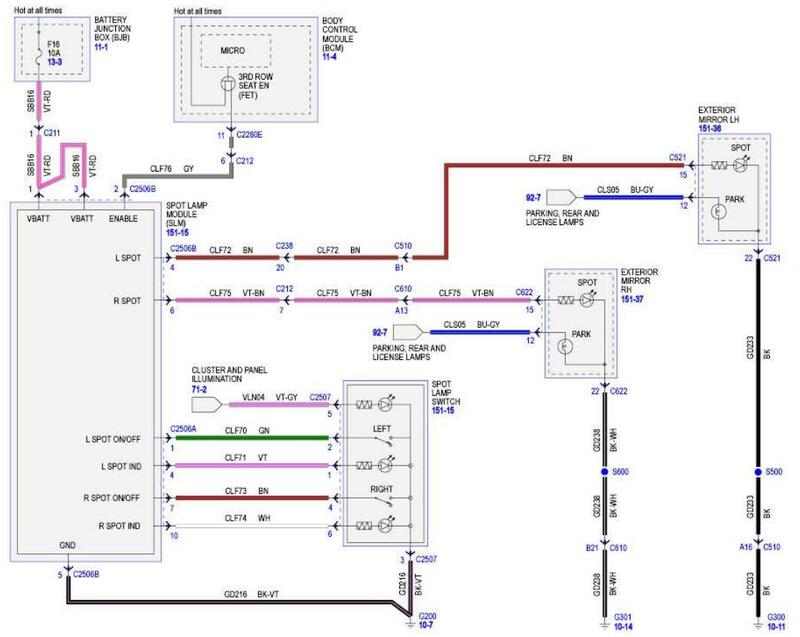 Driver’s side door harness requires modification (4 terminals must be repinned) of 8 pin connector (C541) to 4 pin connector (C505) for LH front door lock switch without memory. Connectors for exterior front door handle switch (C543 & C634) and interior front door handle ambient lighting (C573 & C649) won’t be used. *Lariat (502A w/Technology Package) door harnesses w/22 pin mirror connector, FL3Z-14630-G and FL3Z-14631-J support power adjust, heat, turn signals, power fold & telescope, memory, auto dimming (driver’s side only), spot lamps, LED security approach lamps, BLIS and side camera. 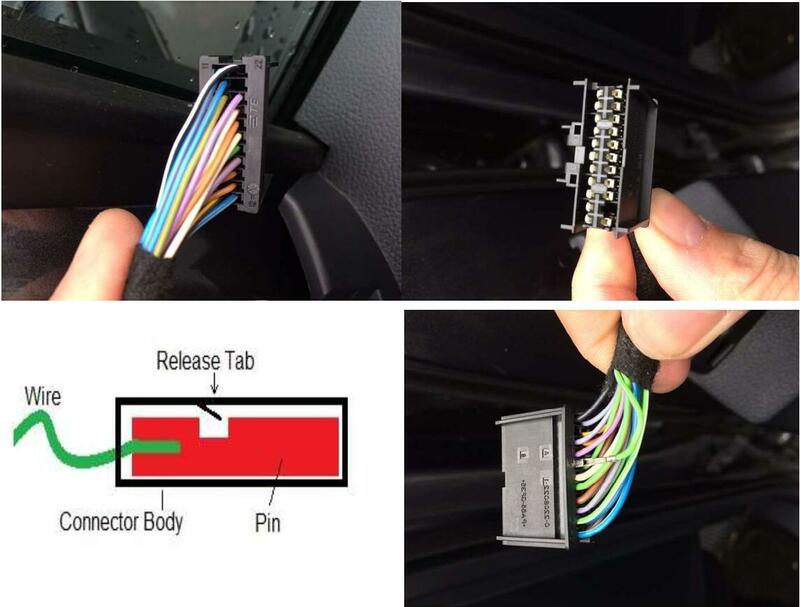 Driver’s side door harness requires modification (4 terminals must be repinned) of 8 pin connector (C541) to 4 pin connector (C505) for LH front door lock switch without memory. Connectors for exterior front door handle switch (C543 & C634), interior front door handle ambient lighting (C573 & C649) and side camera (C5104 & C6104) won’t be used. adjust, heat, turn signals, auto-dimming, LED security approach lamps, spot lamps and BLIS – Does NOT support power fold & telescope, memory or Technology Pkg. w/side camera. 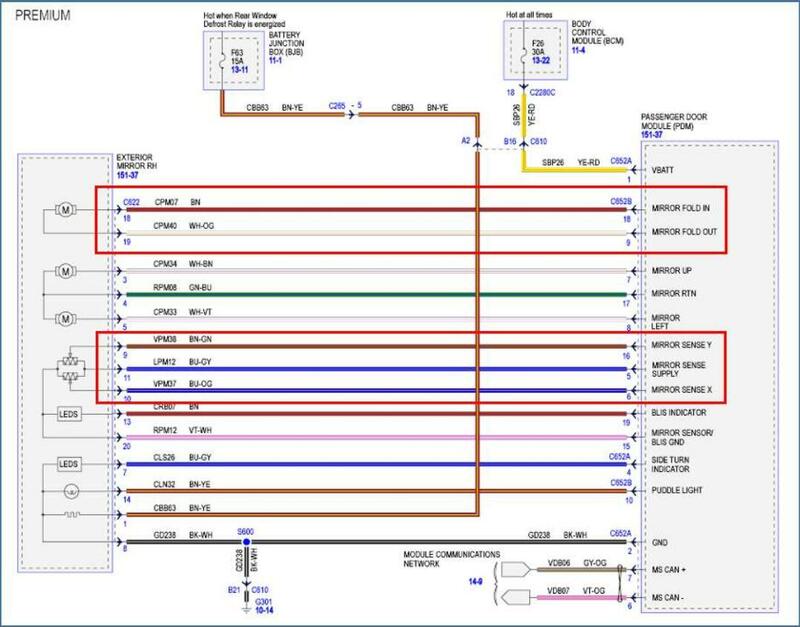 Note: if vehicle currently has 22 pin door harnesses, the existing door harnesses can quickly/easily be modified to support the power fold (not power telescope, memory or Technology Pkg. w/side camera) function by simply adding (5) additional wires from each door module to the 22 pin mirror connector. You will need to purchase (20) DU2Z-14474-CA (WT-1002) wires. This will make (10) wire assemblies – (5) for each door. 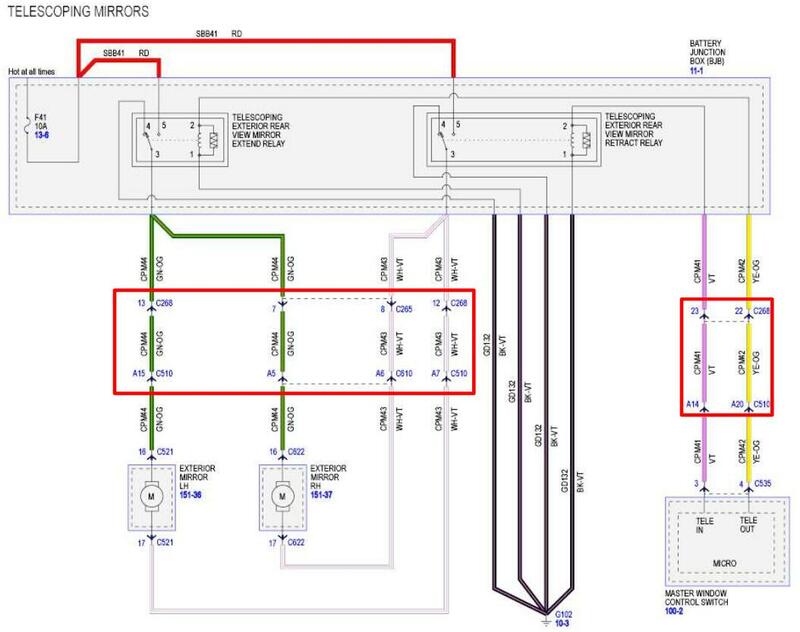 Wiring schematics below show the (5) wires that must be added to each door harness. 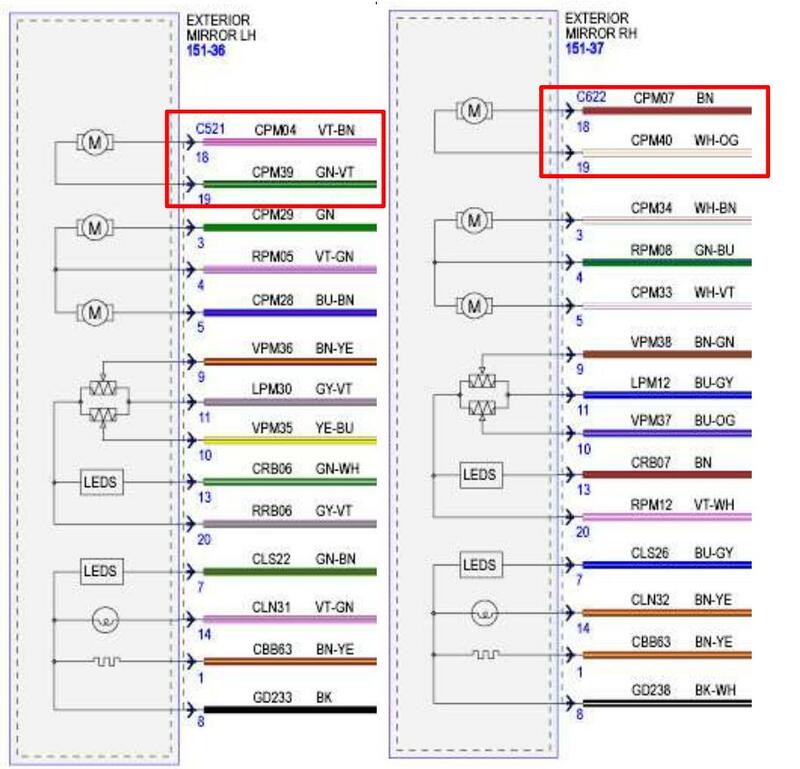 Failure to add the additional (3) wire assemblies to each door harness for Mirror Sense (Memory) will result in DTC C1B15:15 that cannot be cleared in each door module. *BU5T-14421-HA Terminal – C268 Male Connector (LH Side of 14A005 Cab Harness – Engine Harness End). This terminal is NOT serviced through Ford Parts. However this terminal can be salvaged from either of the 8 pin XLT door harnesses (C510 connector – pin A8 or A11, or C610 connector – pin A11 or A21). Suggest using 3U2Z-14A088-AB (WT-56814) 18-22 AWG terminal (splice kit) to connect salvaged terminals to additional wiring – see below. 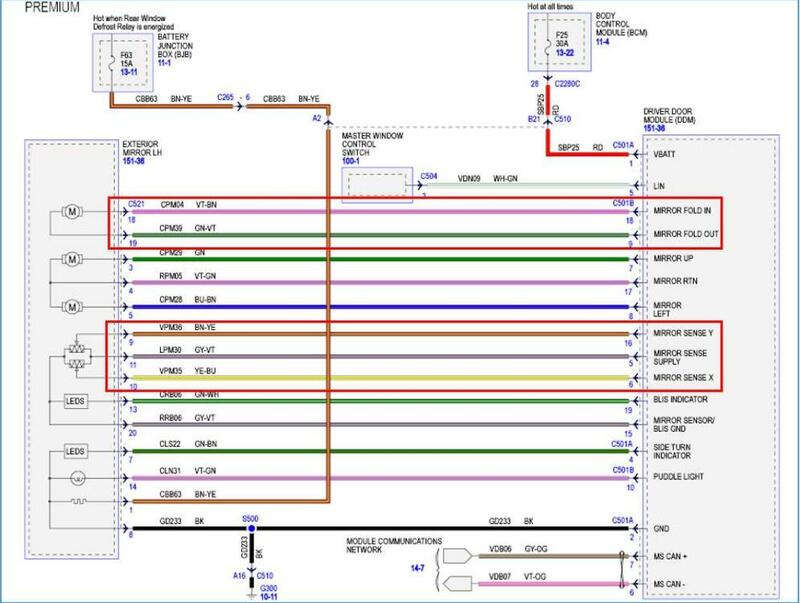 In the wiring diagram below, the additional wires that must be added to the 14A005 dash harness for the power telescope circuit are highlighted in the red boxes. Note:if using FORScan to program replacement door modules, prior to disassembly; make a backup copy of the current DDM & PDM programming. This will simplify and expedite programming the replacement DDM & PDM. Cut / terminate CLF 76 GY wire (pin #2) approx. 1” behind Spot Lamp Module C2506B Connector. 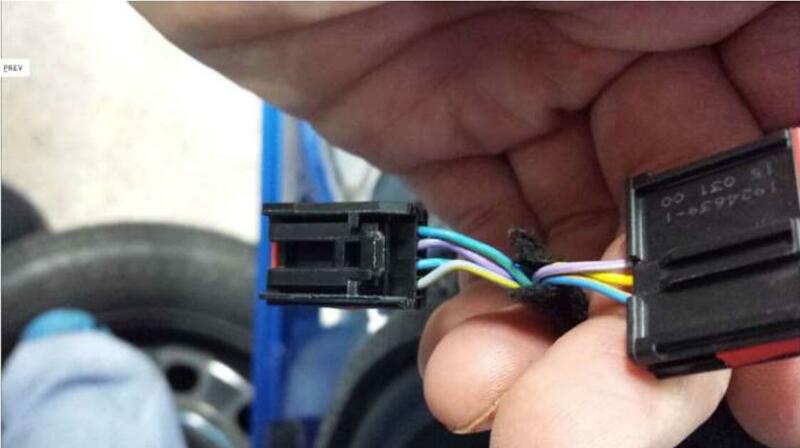 Tape and secure CLF 76 GY wire protruding from dash harness – this wire will no longer be used. Run short jumper wire from SBB16 VT-RD wire (pin #1) of C2506B connector to CLF 76 GY wire protruding from C2506B connector. SBB16 VT-RD wire now provides constant 12V+ to Pin #2 of C2506B connector. 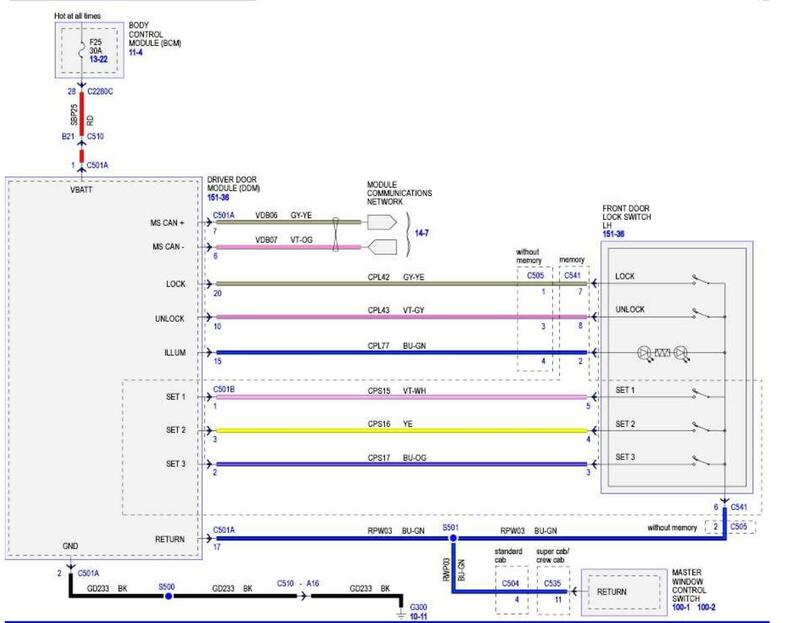 Refer to attached wiring diagram. **Note: if choosing this method to enable the spot lamps, it is possible to exit the vehicle and inadvertently leave the spot lamps on as they are no longer controlled by the BCM. Using FORScan change BCM address 726-56-01 from XXXX X0XX XXXX to XXXX X1XX XXXX (Spotlight Cfg: 0=disable, 1=enable). In most applications the new 726-56-01 value will be 0000 0100 0186. Step #1 is necessary for Trailer Tow Mirrors only. For Non-Trailer Tow Mirrors proceed to step #2.
ii.Unplug exterior mirror wiring harness connector and remove the red lock. The outsideedge just needs to be flexed enough to slide away from the connector. Reprogram Driver & Passenger Door Modules (both Trailer Tow & Non-Trailer Tow Mirrors). Note:There are 2 programming options for Auto Fold: Auto Fold with Key Fob & Auto Fold Lincoln Style. Note: Mirrors will fold closed via lock button on fob but will only unfold when driver’s door is opened/closed. WARNING:Keep objects and body parts clear of the glass panel when carrying out the initialization procedure. During the initialization procedure, the glass panel closes with high force and cannot detect objects in its path. Failure to follow this instruction may result in serious personal injury. Note: Perform one-touch up re-calibration with the door closed. Calibrating with the door open will cause the window to continuously bounce back. 2.Lift and hold the window control switch until the door window is fully closed. 3.Release the window control switch. 4.Lift and hold the window control switch again for at least one second. 5.Press and hold the window control switch until the door window is fully open. 6.Release the window control switch. 7.Lift and hold the window control switch until the window is fully closed. 8.Test for correct window operation by carrying out the one-touch down and one-touch up features. NOTE: The power folding mirrors may need to be synchronized any time the mirrors are folded or unfolded without using the folding switch, or if a new power folding mirror is installed. NOTE: The power telescoping mirrors may need to be synchronized any time the mirrors are extended or retracted without using the telescoping switch, or if a new power telescoping mirror is installed. NOTE: If the power folding or power telescoping mirrors are continuously electronically moved, the power lockout feature disables the system for approximately 3-10 minutes to prevent damage to the power fold motors.After 3-10 minutes have elapsed, normal operation resumes. NOTE: The truck power folding mirror procedure is shown in the videos, other vehicles and power telescoping mirror procedure are similar. 1.Fold or retract both mirrors by hand. 2.Using the power folding/power telescoping mirror switch, operate the mirrors until an audible click isheard. 3.Operate the power folding or power telescoping mirrors an additional 3 to 4 times to synchronize the mirrors.